The consensus of 37 economists polled by Reuters between June 3-10 showed industrial output expanded 1.9 per cent annually after falling 0.5 per cent in March. Only two of them expected another contraction. India's factory output probably rose for the first time in April since January, to reflect healthy growth in core industries, while consumer prices likely eased in May, a Reuters poll found. The consensus of 37 economists polled between June 3-10 showed industrial output expanded 1.9 per cent annually after falling 0.5 per cent in March. Only two of them expected another contraction. 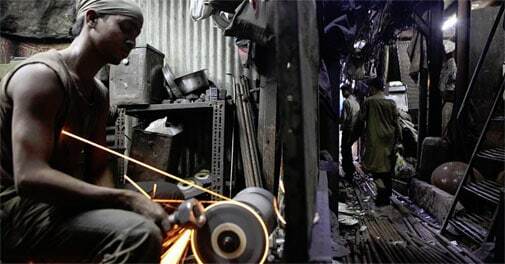 Data released last week had shown production in eight core industries, which have a weighting of almost 40 per cent in the IIP, rose an annual 4.2 per cent in April, up from 2.5 per cent in March. That sharp rise was led by higher output in the electricity, cement, coal, steel and fertiliser industries. Any return to growth in output in April would be encouraging for Asia's third-largest economy, as a slowdown in the manufacturing sector had dragged overall economic growth down to a quarter-century low of 4.7 per cent in 2013-14. "I would hesitate to say that this is a very sharp turnaround ... but the picture should start to brighten. Durable and consumer goods might begin to pick up," said Vishnu Varathan, senior economist at Mizuho Bank. Finance Minister Arun Jaitley's budget next month is expected to take advantage of a clear mandate in Parliament and push through reforms to spur economic growth and tackle high inflation. "I think the first budget will tell us a bit. But the commitment to get infrastructure up and the prospect of many different business and industrial parks with logistical networks to back them coming up, I think these things will get a lot of manufacturing companies coming in," Varathan said. Inflation has persistently hovered close to double-digit levels, and bringing it down was a key plank of Prime Minister Narendra Modi's successful election campaign. The Reuters survey of economists found consumer price inflation probably eased to 8.4 per cent in May, from April's three-month high of 8.59 per cent as food prices fell slightly. But the El Nino weather phenomenon means the monsoons are likely to be delayed and not hit central India until after June 25, hurting crop prospects and potentially driving up food prices. The poll showed wholesale price inflation rose to 5.4 per cent last month, 0.2 per centage points higher than in April. The Reserve Bank of India - which considers both indicators to make monetary policy decisions - has raised policy rates three times since last September to fight stubbornly high inflation. However, with economic growth at precariously low levels, RBI Governor Raghuram Rajan kept its policy repo rate on hold at 8 per cent at the central bank's June 3 meeting, and eased rules in order to free up more funds for banks to lend.